BANGI, 12 June 2014 – Malaysian youth have been advised to master science and mathematics so as to progress in school as well as later on in life. Education Minister II Dato’ Seri Idris Jusoh, said with the addition of Technology and Engineering, STEM (science, technology, engineering and mathematics) is being given focus in recent educational programmes in the country. It is aimed at instilling interest, passion and love for science and its related subjects. 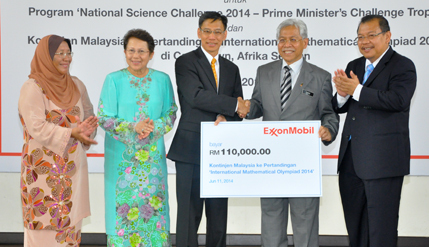 He was speaking when receiving a cheque from ExxonMobil to sponsor two science related competitions, the National Science Challenge (NSC) for the Prime Minister’s Challenge Trophy organised by the Academy of Sciences Malaysia (ASM) and the International Mathematical Olympiad (IMO) to be held at Cape Town, South Africa later in the year. The National Science Challenge (NSC) is a science competition organised by the Academy of Sciences Malaysia (ASM) and endorsed by the Ministry of Science, Technology and Innovation and the Ministry of Education. The donations were used to sponsor six secondary school students, Anzo Tea Zhao Yang, Justin Lim Kai Ze, How Yi Su, Tan Kin Aun Yeoh Zi Yi Song and Khong Kye, who will represent Malaysia at the IMO 2014 competition in Cape Town, South later. They had previously won three silver medals and three bronze medals at the Asian Pacific Mathematics Olympiad (APMO) recently. Idris hoped the ExxonMobil gesture to support the two competitions would inspire more big corporations and companies to do the same and invest in educational programmes and youth activities. “Congratulations and good luck in the challenges you will face in the competition. It is not easy to choose to represent the country from fifteen thousand participants,” said Chairman and President of ExxonMobil in Malaysia See Kok Yew. See said that as a technology-based company, ExxonMobil believes STEM subjects (science, technology, engineering and mathematics) is the basis for socio-economic progress of a country. Learning of STEM is important to meet the growing needs of technology in the country. Hoping that the Malaysian Team to IMO 2014 will do well in Cape Town, See advised them to also have fun, reminding them that the IMO competition is not just to enhance one’s knowledge in science or wining a competition but is also a platform to make new friends, build bridges and make ties between teams, countries and individuals. Idris later presented the Asia-Pacific Mathematical Olympiad certificates to all the six Malaysian Team members.